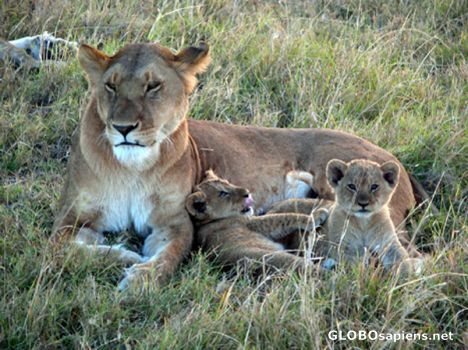 You are here: Member pages » daniserralta » pictures » Lioness and cubs. Lioness and cubs in Masai Mara. Incredibly beautiful lionness with the cachorros. They are so cute, the perfect mother! It looks like they want to play with you, they looks very curious and cheeky! Beautiful shot! The cubs are so cute! Dani, what a wonderful shot, I only hope I am lucky enough to see this sort of sight. Picture barbara! It is hard to get shots like that. Bravo pibe! What a picture ,this is a great picture. Wonderful shot.Mother looks very protective and she is ready to teach her playful childrens the way of life. Perfect formatting and very well framed. Cute too! I really like the way one of cubs is alert and has spotted you. The mother has a nonchalant expression... "I know honey, don't worry about him" and the other little cub is pawing its sibling... "Hey, we're supposed to be playing!"